This is a setup that I've used for a couple of recent posts, including some objective tests and a close-up of some dandelion seeds. 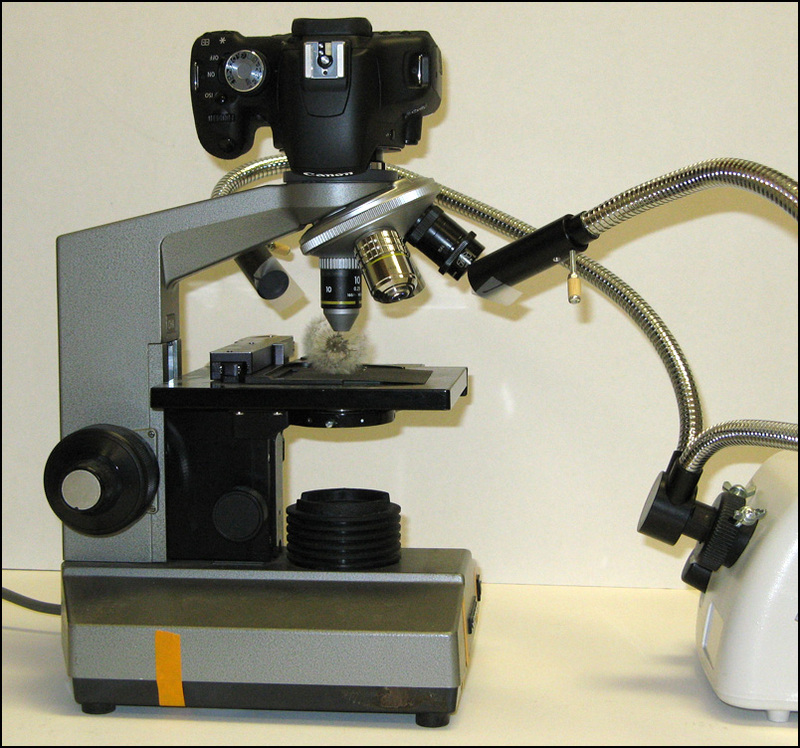 It consists of an Olympus CH base, plus a custom adapter that allows fastening a camera with extension tubes or bellows where the microscope head used to fit. In case you're wondering about the pieces of tape... The orange tape keeps the base of the microscope from falling off! Somebody managed to break off all the screws, as a result of which I got a good price on an otherwise fully functional base. I even got a basic condenser, not shown here. The eBay ad said the light didn't work, but it does. I think they didn't know how to turn it on. The pieces of clear tape over the ends of the illuminator lenses add just a bit of diffusion that helped the appearance of the dandelion seeds. Add a bellows for more extension if needed. In the above pictures, I have removed several wires just for my convenience in staging. In actual use, there were three wires connected to the camera: power from an AC adapter, wired remote shutter switch, and HDMI to a video monitor. Sometimes there is a fourth wire for USB to a laptop computer, but usually I just let the images accumulate on a memory chip inside the camera and then physically port that chip to my main computer which is in a different room. The adapter is just a chunk of plastic turned on a metal lathe, made on one end to fit the microscope's "dovetail" above the objectives, and on the other end an M42 thread to fit other accessories I have lying around. The adapter also does double duty, having internal threads that allow a Nikon BD objective to be stuck on the end of an M42 setup. Your method is rather more elegant, Rik, but I achieved much the same with a flat-fronted metal body cap. That isn't the easiest thing to find, but they do come up. I drilled the middle out and attached an Olympus dovetail to it using the 3 screw holes. That works. I didn't have an Olympus dovetail, but do have a lathe, so I took this approach instead. Somebody without the lathe would be better off taking your approach. 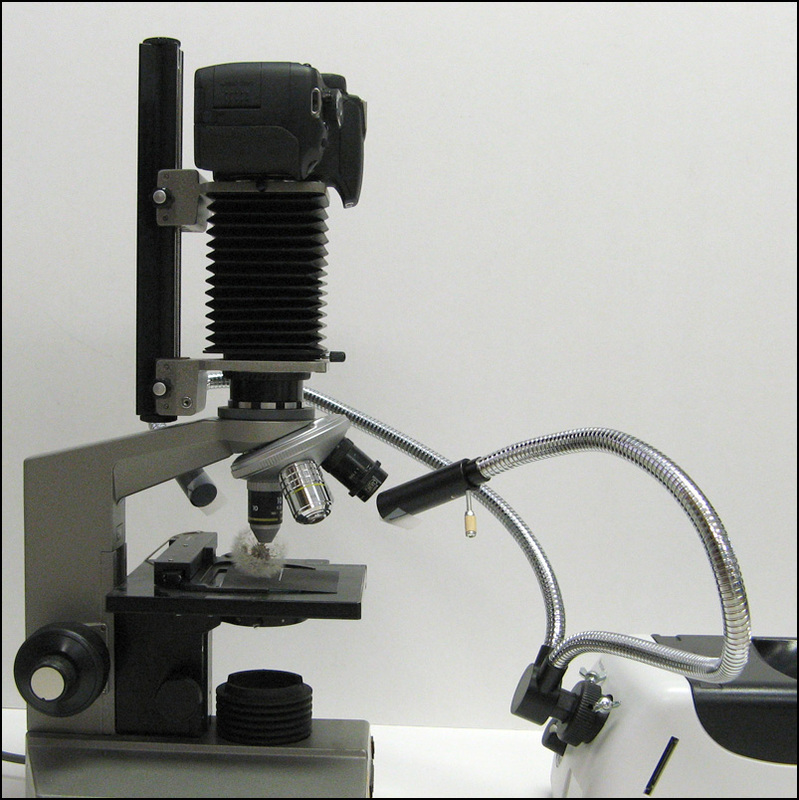 Another reasonable alternative is to just suspend the camera over the microscope on a copy stand, and fill the gap with a bellows. I like this setup it allows to get objective magnification X 1 and fill the frame (Canon 450D, my Nikon 4X/0.13 DL is the only one that does not fill the frame using transmited light (I have to test with reflected light)), I used the Nikon trinocular head + Nikon 1X TV relay lens and the frame was never filled with any of my objectives). One possible drawback I see is the limited course focus for roughing in the initial focus and various objective WD limitations/requirements when using large subjects such as the dandelion. Have you found this to be the case? Sure. This setup is very convenient for some tasks and very awkward for many others. Coarse focus is not as much trouble as you might guess, since the Olympus focus block gives about 30 mm of travel. But orienting and illuminating the specimen can be quite difficult. More often, I would use some "open" setup as shown in all my previous postings, instead of trying to work inside the microscope frame and stage. Also, I don't have a lathe and don't have an Olympus dovetail. Where would I get a dovetail? Will this kind of surgery work on most microscopes? The University of Washington has a bunch of surplus microscopes for sale: http://www.washington.edu/facilities/transportation/movingandsurplus/inventory/item/microscopes They also have live auctions every couple of months that also allow online bidding. I think this would be the case for most decent scopes which would have interchangeable binoc/trinoc heads. elf, lauriek is correct -- no surgery at all. The purpose of the dovetail fitting is to allow interchanging heads. All I've done is to create a special purpose photography head. Whether it works as desired depends on whether the objective plays nicely with whatever optics are left when the head is removed. The Olympus CH is a finite-tube design; removing the head leaves nothing except the objective. Barry, I haven't done anything hands-on with infinity scopes or objectives, so the answer to most of your questions is "I don't know". Probably the easiest way to get an Olympus dovetail would be to buy a junk for-parts-only head and salvage the dovetail from it. See ChrisR's post, second in this thread. It would be wise to check the dovetail diameter before purchasing. I've read recently on Yahoo Microscope Group (HERE) that some manufacturers use multiple sizes. I don't know whether Olympus is one of those, and I have never seen a specification for any manufacturer's dovetail. If you do have the diameter checked, be sure to nail down exactly what it is that's being measured. 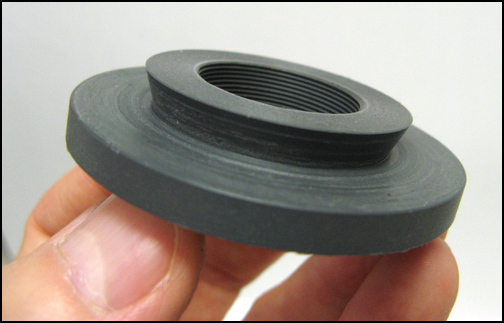 I have seen measurements quoted for the widest part, the narrowest part, and the intermediate point that results from using 3.0 mm thick caliper jaws to measure the narrowest part they can reach. Ironically that last one may be the most useful, since it's an easy measurement to make and it corresponds closely with how the dovetail actually fits against the mounting lugs. 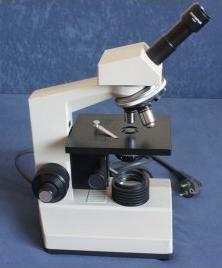 Olympus CH part-microscopes aren't very expensive. They seem to get beaten up in colleges! 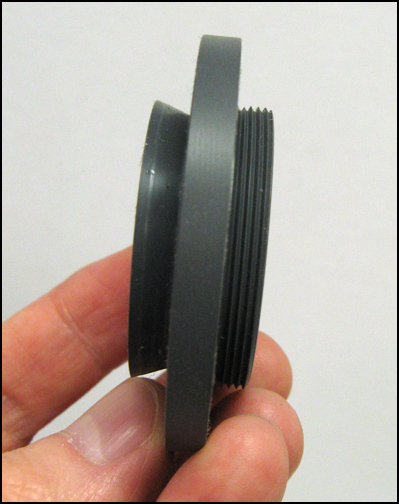 The lower pic shows a body cap with a suitable hole, and the dovetail ring. Method for achieving greater working height is mentioned. After seeing Rik's post in this thread and his other on the Edmunds Nikon Finite 10 0.25 I thought I would give this approach a whirl. to attach my D200 and a PK13 extension tube. Shoulder of objective to sensor worked out to 157 mm. Removed the Apl condenser and made a box with a mirrored interior with a hole in the side to accept a flash and a hole in the top with a diffuser cover as a brightfield light source. Thanks for sharing the info Rik . Having a setup that is self contained and can be taken on field trips /is easy to setup and change is really cool . Orchid testa stacked in HF using the Nikon finite conjugate 10 0.25 at 4 um increments. There are a couple of spots of what I assume is "mush" . I would love to hear suggestions for improving as this is the first real proper stack I have tried. I added a link to a full size version- is this the sort of resolution one should expect ? Will, I'm glad you found the setup helpful. I had not thought about the field trip aspect, but I had noticed that the setup felt remarkable solid once it was all fastened together. Mirror/shutter vibration is always a concern with a hard-mounted setup, but with flash as you have it, your effective exposure times are probably short enough that you would be OK even with tough subjects like things in water. I get away with continuous illumination because I'm using Canon's Live View with electronic first shutter curtain. Your image looks very good for a first attempt. The overall sharpness looks fine. There are some spots that are fuzzy, but it's hard to tell from here whether those are due to "stacking mush" where the software failed to identify low contrast detail, or due to missing frames at ends of the stack. You can get a feel for that by looking at the original source frames. Opportunities for improvement, the most obvious is just to make sure that you have enough frames to cover everything you care about. For this type of image, my personal preference is that everything be sharp. But there are tradeoffs -- if one end of the subject happens to be tipped way close, getting it sharp may not be worth all the extra frames. Switching topics, I have a question about your subject. When I did a Google search on define: testa, I got back words about "protective outer layer of seeds". So what am I looking at here? Is the small brown oval thing in the center the actual seed, and the transparent mesh thing around it is a protective layer?